Follow the white stripes, stay on the trail, and do not disturb the cryptobiotic soil or water filled potholes. PLEASE don't bring your dog - the burning hot sandstone surface tears away their paw pads, leaving them raw and bloody halfway through the ride. If you absolutely must bring them, bring extra water - make sure they leave the water in the potholes for the local wildlife. Slickrock is often called the best bike ride in America. That's highly debatable, but what is not: it is one of the coolest, most unique experiences you can have on your bike. The entire trail is very exposed and very crowded. It's open to motorized dirt bikes. Bring lots of water, avoid hot days, and come early or late in the day to avoid crowds. Sunset is a spectacular time to be out, as long as you know you can get back before dark! There is a fee of $5/vehicle or $2/bike to enter Sand Flats Recreation Area. There is lots of great camping along Sand Flats Road, within easy biking distance to this trail and others in the area. Starting from the largest parking lot ever dedicated to a single trail, head north on easy terrain. You'll come to the Slickrock Practice Loop in .25 miles, which is well worth the detour. It's a good introduction to the main Slickrock loop, slightly easier and adds another fun mile to your ride. It reconnects to this trail half a mile later. The trail is a never-ending series of short but incredibly steep climbs and descents. The rock provides incredible traction, and after a while, you'll realize that everything here is rideable, even if it appears to be way to steep to ride at first. If this is your first time, walk the steeper ones and work up the difficulties slowly - falling on rock hurts more than dirt. From the intersection with the Practice Loop, you'll ride a short connection to the main loop. Along this section, you come to a cool view down Abyss Canyon, then wade through a sandy pit, and then intersect with the 4x4 trail called Hell's Revenge (don't follow that trail by accident). At 2 miles you'll come to the loop part of this lollipop, and the preferred direction is clockwise (though either way is fine), so take a left and ascend along 'swiss cheese ridge' high above Moab. This is a long, generally straight in direction, section of trail. The ups and downs are steep for sure. Along the flatter sections of slickrock, be on the lookout for potholes that cradle prickly pear cactus or want to swallow your tires. At 3.5 and 5 miles, there are optional spurs (each a couple tenths of a mile) that go to the edge of the cliff for great views and are well worth it. The trail turns to parallel the Colorado River here and begins to descend towards a vast, flatter expanse of slickrock. It's wise to roll up to edges slowly. The Natural Selection viewpoint at 7 miles is really cool, and a great place for a rest before you head back to the west and south to complete the loop. On the return you'll find more punchy climbs and steep descents with some sand traps mixed in for good measure. This part of the route will pass a couple of different canyons and you'll get some spine tingling views across the red rock landscape. There's one big climb and descent to tackle before reaching the intersection to head back to the trailhead. 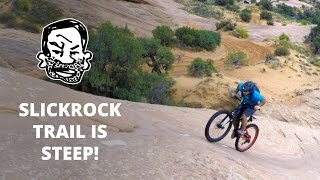 Your legs will be tired but keep riding, you're about the complete the world famous Slickrock! The rock is Navajo Sandstone: 200 million year old petrified sand dunes from the Jurassic Period (yep, dinosaur fossils are all over Moab). 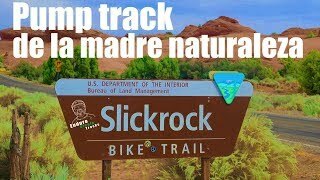 The Slickrock Trail was originally created by dirt bikers in 1969. Though incredibly tacky for bike tires, horses with metal shoes do not have the same experience, so settlers in the 1800's named it "slick rock". Bridget's first time on this ride. Ups are the hard part. Doable, but very strenuous! Entire loop; with Sheri and Jason and Jared. Great day! Left 7:30am. Was quite hot by the time I got back... but well worth it! A fun ride that gets HOT in the afternoons. It's longer than it looks. Bring water and a camera - it's GORGEOUS! Ride safe! Amazing trail! Glad I listened to the people at the Chili Pepper bike shop and went early in the morning and not in the afternoon! It was another great day in Moab. Weather was a bit warm and winds were high. Good weather, good ride. Some steep climbs. Conditions were mint. Sunset ride was great, not too hot and no one else riding! Wipe out. Almost broke ribs. Hurt like heck but finished ride. This trail is A BEAR! 50/50 hiking biking. Incredible ride, so unique. Rode this fully rigid, first time last time! Shrimp Rock ahead on the Slickrock trail. Spring time is a beautiful time to visit Moab! Slickrock surfing back to Sand Flats. Hanging out during sunset on Slickrock. Sunset ride at Slickrock Practice Loop. The views of the La Sal mountains is pretty sweet. Views of Arches NP and Colorado River. The best part of Slickrock. The view. There's life among the sandstone. Shrimp Rock in the background. Trail junction to head out to the Main Trail loop.